Our product range includes a wide range of bhatti gas furnace. We have set a benchmark in the industry for manufacturing and supplying Bhatti Gas Furnace. 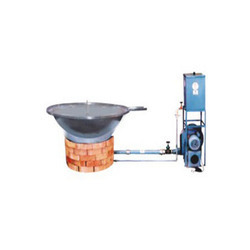 The offered furnace is used for making food in restaurants and hotels. It is exceptional in terms of quality and durability. This furnace has earned us a huge clientele for being fuel efficient and available easily. We have a large product line for meeting the demands of the clients. Looking for Bhatti Gas Furnace ?